Can you believe it? We are beginning Holy Week and next Sunday is Easter. Even though we have been blessed with a few peaks of warmer weather in March, we still are wondering when spring will actually arrive for good. I had to chuckle the other day when I read a columnist in one of our Chicago newspapers suggesting that we have five seasons in Chicago: spring, summer, fall, winter and “waiting for spring.” That actually is an apt description of what ordinarily happens around these parts on an annual basis. But back to Holy Week and Easter: as someone has said, there are only two things that are inevitable—death and taxes. We all have had to deal with deaths of loved ones and friends, and it’s not an easy process. Both of my parents are now deceased. I think of them often, pray for them every day, and visit their graves whenever I am home in Indianapolis. While I knew their earthly lives would come to an end sometime, still the reality of their deaths was not easy to deal with emotionally or psychologically. The same was true with the large number of people that I have had the privilege to celebrate their funeral liturgy and preside at their burials. As a priest, you have to toughen yourself not to become so attached to each family that is grieving but also not so distant that you act as a mere robot in these circumstances. No one can journey to the threshold of death with a beloved family member or friend without confronting that horrible, natural question of whether this is all there is, whether this is the end. Even for those enlightened by Christian belief, the possibility still haunts us because faith has to do with things unseen, a life promised but yet to come. We journey toward that new life together. That is why the fires of faith are first lit and then fanned within a community of faith, the Church. Lent and Easter bring us to the central point of this great mystery: the fact of real death and bloody death, an execution in fact, and the faith-filled vision that love will not be denied or extinguished by death, that those we love continue, as does their love for us, that love reigns supreme and will have the final word. These two seasons—Lent and Easter—make up the great 90 days in which we go there, into that mystery, together and in the company of Christ. This we understand as the journey toward baptism and into baptismal living, a form of life that always holds together the two mysteries of death and life. Lent begins with our Lord being drawn by the Spirit into the desert for 40 days following his baptism by John. The community of the Church follows him there in our great 40-day Lenten retreat as we prepare our newcomers, our catechumens who are now elect, for baptism, and prepare ourselves to renew our baptismal covenant alongside them. We simplify our lives and strive to walk more conscientiously with the Lord through prayer. We experience hunger through fasting, our weakness and our simple humanity. We are opened by the Spirit to the physical and spiritual hungers of others and learn new ways to offer them both kinds of bread through almsgiving. As we newly experience these central communal disciplines, we immerse those preparing for baptism in them with us. At this point in time, we can look back over the previous five weeks of Lent in order to assess just how well we have done in this regard. Hopefully at the beginning of Lent we took the time to develop a plan for our Lenten journey this particular year. If we have done that, then we are more able to determine whether that plan was realistic, attainable and fruitful. All too often as we approach Holy Week, we can become disappointed that we were not strong enough to persevere day by day in what we had determined to do. If by chance that is what you are feeling as you read this article, don’t get discouraged. Life is about new beginnings, and these last days of Lent 2019 can be extremely meaningful and productive if only we allow ourselves and the Spirit to cooperate and to be wholly honest and effective. Lent makes the transition to Easter during the three days of the Easter Triduum. The liturgies of Holy Thursday and Good Friday have no concluding rite. The community is not sent forth. We simply depart. These three holiest of Christian days form one continuous act of worship that holds in vital tension the whole central mystery of human life redeemed in Christ—a voluntary, salvific death and a things-will-never-be-the-same resurrection. What is the central act of the three days in which the community of faith proclaims this seminal mystery? It is nothing less than the plunging of new believers into the dying and rising of Jesus Christ through the waters of baptism. In that same central baptismal liturgy, all of us then renew our baptismal commitment to Christian discipleship. This is a discipleship that does not deny suffering and death but stares it in the face, in the strength of Christ, and declares that love has won and we will live forever in that love, beginning in these waters. By baptism, we are plunged into the dying and rising of our Lord (Rom 6:3-11). We share in that great mystery and are offered its full grace in the living out of our lives. In this way, our dying has already happened in baptism—dying to a world that lives for itself, not for God and others. Our physical death will only be the final act of that dying begun in these waters. But the dying is part of the rising, the coming up from those waters with fresh heart and hands, the heart and hands of Christ still loving and feeding a hungry, longing world. This real, sacramental experience is the very rhythm of our lives through baptism. Lent and Easter plunge us anew into that deep and mysterious rhythm, simplify us to see once again a Lord who longs to transform us into that new garden place where tears and suffering, and, yes, death simply have no space to call their own. The resurrection of the Lord is the centerpiece of this great hope. Isn’t this the full force of St. Paul’s heartfelt cry to the Corinthians? been raised, your faith is in vain (1Cor 15:16-17). Be sure to make your plans now to participate in all or as many as possible of the Holy Week liturgies either at your home parish or here at St. Peter’s. We will have our regular weekend Mass schedule for Palm Sunday with the palms being blessed at the beginning of the service near the baptismal font and then the proclaiming of the Passion at the Gospel time. Palm Sunday reminds us that we too often shout our acknowledgment of Christ as King as did the people that triumphal day in Jerusalem, but then we can fall later and back off with our “Crucify him!” by our giving into our weaknesses and sinning. There is no better way of recommitting ourselves to Jesus than living this Palm Sunday experience over and over. Holy Thursday, the day on which we commemorate the institution of the Eucharist and the sacrament of Orders, has always been a special day for the Christian community. We have grown to realize how essential both of these sacramental encounters are to our personal faith and to the Church. While every Mass is a continuation of the Eucharist, the celebration on Holy Thursday puts the entire importance of the Eucharist into perspective. The washing of feet, or also called the Mandatum (the command of Jesus to the apostles), brings home to every follower of Jesus that each one of us is called to wash one another’s feet: to live humbly and to treat each other with dignity and respect. No one is greater than another in offering service and assistance to our brothers and sisters. 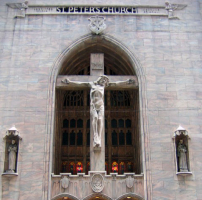 Here at St. Peter’s we have two Holy Thursday services scheduled at convenient times so that workers and shoppers might participate: at 12:15 and at 5:15 P.M. The washing of the feet will only be at the 5:15 Mass, and this year instead of inviting everyone to the rear of the church to have their feet washed, we will wash the traditional twelve peoples’ feet on the apron in the front of the church. We also invite you to join us for Morning Prayer in the auditorium at 8:15 A.M. and for Adoration of the Blessed Sacrament also in the auditorium from immediately after the 5:15 liturgy until Night Prayer at 7:45 P.M.
And, if you have not yet celebrated the sacrament of reconciliation during the Lenten season in preparation for Easter, Holy Week is your last opportunity to do so. We will have additional confessors all day from Monday through Thursday to accommodate everyone. I remind you that confessions will end in church at 4:30 P.M. on Holy Thursday. Therefore, make your plans now to come to St. Peter’s no later than Thursday to celebrate this marvelous sacrament. Good Friday: The hour of suffering and defeat, glory and victory, has arrived. Today, everything is stripped bare. Our wrongdoings are naked and exposed as we ponder the mystery of so great a love. Each of us is Barabbas, the “son of the father,” whose offense is borne by Jesus, the true “Son of the Father.” Jesus is God’s suffering servant who can sympathize with our weaknesses. He is our high priest, our intercessor before God, so we can be confident that we will receive mercy and favor in time of need. Jesus knows how often we reject the truth out of cowardice and fear. We deny being his followers. More often we are “friends of Caesar” rather than friends of Jesus. We have bought into the system of power and control instead of God’s community of love and service. Jesus tells us, “Here is your mother. Here is your son.” He wants us to care for the widowed, the orphaned, the immigrant and the alien. When we wrap the Body of Christ in the arms of compassion, we will embrace the whole world with sacramental grace. We invite you to join us for Morning Prayer in the auditorium at 8:15 A.M. We will have two solemn services of the Lord’s Passion: one at 12:15 and the other at 3:15. At each of these services there will be the reading of the Passion, a homily, intercessory prayers, the veneration of the cross, and Holy Communion. If you cannot make either of these services, we will also have the Stations of the Cross at 5:15. The church will remain open until 7:00 P.M. In all churches throughout the world, the entire Good Friday collection is sent to the Holy Land for the upkeep of the Holy Places and to foster places of pilgrimage and housing for those who visit the Land of the Old and New Testaments, including where Jesus spent the vast majority of his earthly life. These places are almost entirely staffed and maintained by the Franciscans, the same religious community who staff St. Peter’s. Therefore we ask you to be especially generous in your contributions on Good Friday so that our brother friars may continue their ministry of service to pilgrims and to residents of this Sacred Ground. I will write about the Easter Vigil and Easter itself in next week’s bulletin, but for now please note that our Easter Vigil service will begin at 7:00 P.M. and our Easter Sunday Mass schedule is the same as always: 9:00, 11:00, 12:30 and 6:00. May your Holy Week this year be one of the most meaningful ever. We’ll try to do our part to make it happen. Today’s readings for Palm Sunday highlight the resolve of God’s servant to fulfill his will. In the First Reading, the “servant” speaks. This is the third of four servant oracles in the Book of Isaiah. The servant goes unnamed, but he is depicted as freely giving over his will to God. Here we are told that he did not refuse when God opened his ear to hear what a disciple needs to know, and he set his face like flint to do God’s will, knowing that God would not allow him to be put to shame. The Second Reading invites us to join our voices in praise of the Christ who emptied himself to take on the form of a slave and accept death on a cross. Because of his openness to God’s will, he is exalted above every other name in the universe, but Paul situates the hymn in an admonition: “Have among yourselves the same attitude that is also yours in Christ Jesus.” Thus, we are called to join our lives to the self-emptying of Christ. Today’s Gospel recounts the story of Jesus’ passion and death as told by Luke, beginning with the Passover meal that he shared with his disciples to his burial by Joseph of Arimathea. But this journey to death began much earlier in Luke’s Gospel account. In Luke 9:51, we are told, “When the days for his being taken up were fulfilled, he resolutely determined to journey to Jerusalem.” Indeed, Jesus’ entire life was oriented to the Paschal Mystery, the process of dying and rising to new life. As his disciples, we are called to do the same. Today’s reading from Isaiah depicts a servant who relies on God in order to “speak to the weary” and who opens his ears so that he “may hear.” This servant does not rebel; instead, he allows himself to be beaten and spat upon. This suffering Servant can be seen in the hymn from Philippians that describes Christ Jesus as emptying himself and “becoming obedient to the point of death.” The Catechism of the Catholic Church explains that Christ’s humility is a model for those who follow him. “In humbling himself, he has given us an example to imitate” (#520). We look at the suffering of Jesus in light of God’s plan of salvation. By seeing our suffering in the light of faith, we find redemption in the struggles and pain of life, the Catechism of the Catholic Church explains. When evil, injustice, and suffering test our faith, the Catechism explains it is important to turn to the witnesses of faith such as Abraham, Mary, and others (##164-165). In the Gospel at the Procession, Jesus arrives in Jerusalem on a donkey, a manner that would be unlikely for a king. The Catechism explains that Jesus’ entry into Jerusalem on Palm Sunday is a messianic action. He comes as a Messiah who is humble and poor (##559-560). For Your Reflection: How can the depiction of Jesus in the reading from Philippians be a model for how you should act? When have you prayed to God to take a cup of suffering from you? What can you change in your week to enable you to attend a liturgy on Holy Thursday, Good Friday, or Holy Saturday?